In the early 1900s, Jacob Haish and many other DeKalb notables offered ideas and even monetary pledges to bring a new courthouse to DeKalb. Sycamore had been home to the courthouse for years, but the city of DeKalb thought it should host a larger building to fit the growing county's needs. 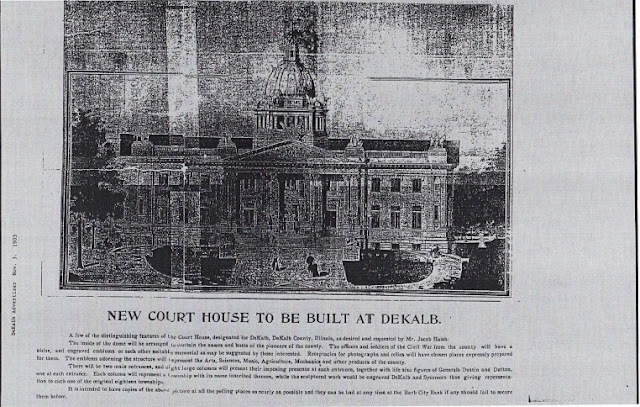 Below is an image and excerpt that Haish used to "sell" his ideas for a DeKalb courthouse. In the end, Sycamore "won" and a new courthouse opened in 1905 on State Street, where it still stands today. The inside of the dome will be arranged to contain the names and busts of the pioneers of the county. The officers and soldiers of the Civil War from the county will have a niche, and engraved emblems or other such suitable memorial as may be suggested by those interested. Receptacles for photographs and relics will have chosen places expressly prepared for them. The emblems adorning the structure will represent the Arts, Sciences, Music, Agriculture, Mechanics and other products of the county. There will be two main entrances and eight large columns will present their imposing presence at each entrance, together with life size figures of Generals Dustin and Dutton, one at each entrance. Each column will represent a township with its name inscribed thereon, while the sculptured work would be engraved DeKalb and Sycamore thus giving representation to each one of the original eighteen townships. It is intended to have copies of the above picture at all the polling places as nearly as possible and they can be had at any time at the Barb City Bank if any should fail to secure them before."